The transition-metal-free generation of a series of primary arylamines from potassium aryltrifluoroborates and phenylboronic acids­ is reported. The method uses a mild, inexpensive source of nitrogen (hydroxylamine-O-sulfonic acid) in cooperation with aqueous sodium hydroxide in acetonitrile. 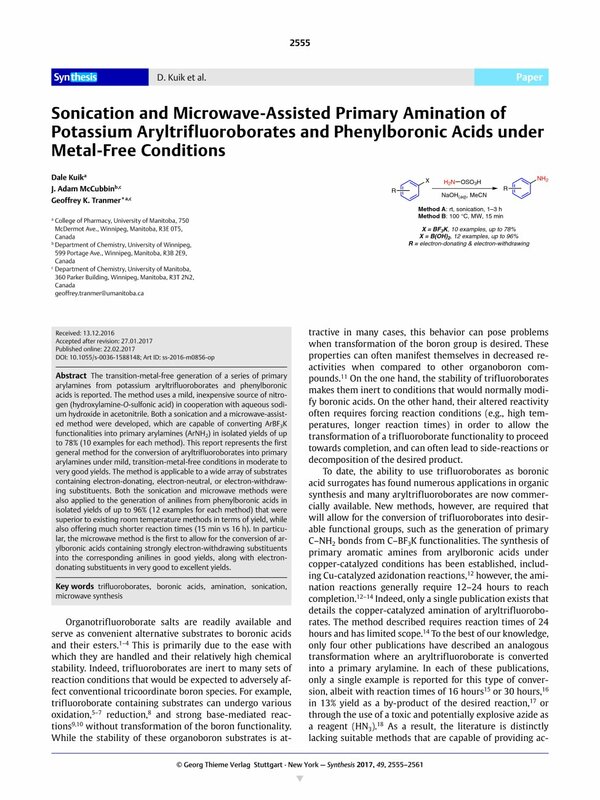 Both a sonication and a microwave-assisted method were developed, which are capable of converting ArBF3K functionalities into primary arylamines (ArNH2) in isolated yields of up to 78% (10 examples for each method). This report represents the first general method for the conversion of aryltrifluoroborates into primary arylamines under mild, transition-metal-free conditions in moderate to very good yields. The method is applicable to a wide array of substrates containing electron-donating, electron-neutral, or electron-withdrawing substituents. Both the sonication and microwave methods were also applied to the generation of anilines from phenylboronic acids in isolated yields of up to 96% (12 examples for each method) that were superior to existing room temperature methods in terms of yield, while also offering much shorter reaction times (15 min vs 16 h). In particular, the microwave method is the first to allow for the conversion of arylboronic acids containing strongly electron-withdrawing substituents into the corresponding anilines in good yields, along with electron-donating­ substituents in very good to excellent yields. Supporting information for this article is available online at http://dx.doi.org/10.1055/s-0036-1588148.